Since the Age of Exploration, nearly every corner of our globe has been charted, but there's still a whole universe out there waiting to be explored. 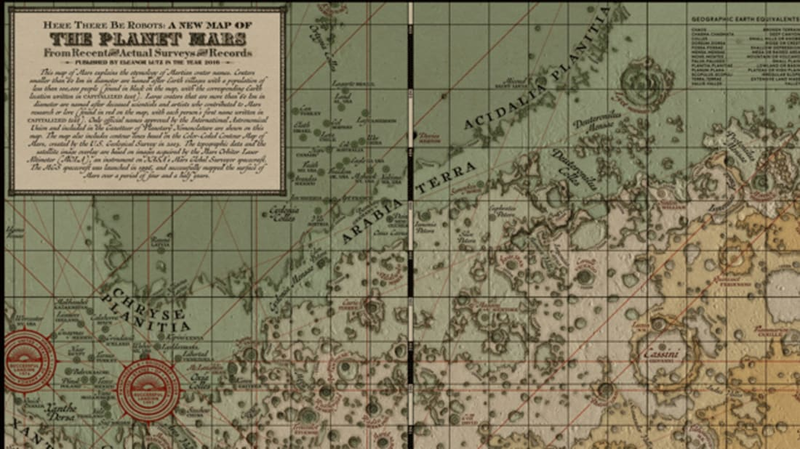 This map of Mars imagines how the modern era's "new world" might have been illustrated if it had been explored by cartographers centuries ago, Gizmodo reports. Designer Eleanor Lutz, who has a science background and regularly creates science-themed infographics, was inspired to draw the map after developing an interest in the maps created in the medieval age. "I thought it would be fun to use their historical design style to illustrate our current adventures into unexplored territory," she wrote on her blog Tabletop Whale. To create the map, which she titled "Here There Be Robots," Lutz pulled data from NASA's Mars Orbiter Laser Altimeter. Each landmark and rover landing site is labeled, and a key giving the geographic Earth equivalents of the Martian terrain is provided. NASA's actual Mars imagery is laid over the map, so you can make out the fine details of the red planet's face where Lutz's lines aren't perfect. Posters of the map are available for purchase from Redbubble starting at $13. Image courtesy of Eleanor Lutz.